Scott's journey on the path began 18 years ago with a one-way ticket to Kathmandu. Upon landing there, he immediately gravitated toward these profound teachings, which permeate the city and began doing short retreats at Lama Zopa's center in Kathmandu. His trip quickly turned into a pilgrimage, to Bodhagaya and was followed with an intimate teaching by HH Dalai Lama. This introduction to the Dharma has been followed with incredible good fortune to receive the teachings & blessings of many of the greatest living masters of our time. Scott has spent much of the past 10 years practicing the three wisdoms with Michael Gregory, completing many group and solitary retreats, & pilgrimages in Bhutan, Sikkim, & to Jamgon Kongtrul's hermitage in Eastern Tibet. Scott feels his expertise is in his sensitivity to the pitfalls and challenges of maintaining a rigorous spiritual practice inseparable from the duties of a householder. 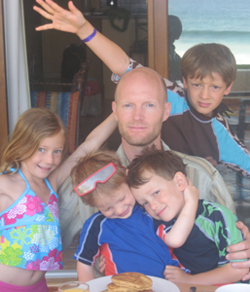 Scott & his wife Stacy have been married for fourteen years and have four children ages 4, 6, 8, & 10. He has enjoyed a twenty-year career in managing a private fine-dining club in Aspen, Colorado. "My claim to all who enter the path of authentic mindfulness practice is this: you will quickly see that everything you thought about reality & appearances is NOT what you thought it was...... and, that by working directly on the root cause, through meditation, all of your negativties or afflictions will begin to dissolve from your life."